Romance is a very subjective thing. Traditionally, flowers & candy are considered part of a romantic date, but what is romantic for one person may not be for someone else. While a dating site cannot be 'romantic', the sites listed here seem to be focused more on the romance of dating. Romance Passions is a free dating site for singles with a love of romance. Join for free and take advantage of free email, chat, forums and more. Can you really have romance without chemistry? 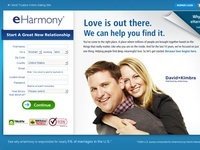 eharmony uses proven matching technology to screens hundreds of thousands of people to find only the ones that are right for you. "Falling in love still takes chemistry, but we maximize compatibility with every match we make!" "AsianDating is an Asian dating and personals site that assists people to find an Asian partner for friendship, romance or marriage. You can use our site to find Asian singles, Asian ladies seeking marriage, Asian chat, Asian friends or Asian penpals. Our site is one of the largest Asian American dating sites with single Asian women and men from all over Asia and the USA. Get started now! - Join for free to start meeting Asian singles for friendship, dating or marriage."